Episode 008 – How Do I Create a Sense of Urgency in My Appeals? Creating a sense of urgency in your appeal messaging will help move readers to become donors. What if you have a difficult time creating a sense of urgency? In episode 8 of Nonprofit Answers, Rob asks a question about how to create urgency in his appeals for a women’s shelter. Jeremy explores why you want to create urgency and how to do it. I need you to stop everything you’re doing and listen to this podcast. It is very, very important that you listen to this podcast right now, so that you can learn core concepts of urgency. So today, we’re going to talk with Rob, who is having some problems identifying what is urgent about the nature of his nonprofit organization. So before we get into that, let’s review two campaigns from two different similar nonprofits. The first campaign comes in, and the language in the appeal is very urgent. It talks about needing the money right now. It has a deadline. It demonstrates to the reader that what they’re appealing for is necessary and that they need to receive the money now in order to achieve what their goal is for the campaign. The second nonprofit sends an appeal, talks about the campaign and what they’re going to achieve, talks about the good work they do, but does not have urgent language in the appeal. How is the donor going to respond to these two different appeals? The donor is going to respond to the first appeal that had urgent language because in their mind they’re thinking, “This organization needs my money right now. The other organization doesn’t need my money right now, so it can wait.” So he sends his donation into the first organization and takes the second organization and does … He sets aside the appeal and says, “I can afford to give to this organization later.” The problem is, he probably never does. So let’s jump into this question from Rob and talk about urgency and appeals and how you can have urgency in your appeals even if you don’t feel like your organization has an urgent need for the money right now. Hi, my name is Rob, and I have a question about urgency. I know I’m supposed to write an appeal that creates urgency, but our appeals for our women’s shelter just doesn’t have anything urgent. We have monthly expenses that we need to meet, but it doesn’t feel like I can use that to make the donor feel urgency. What should I do? Thanks for this. I really appreciate it. Rob, thank you so much for the question about urgency. Creating a sense of urgency in your appeal messaging will help move your readers to become donors. Many people think that this is just a trick. If you think this trick no longer applies in your appeal messaging, then let’s consider the case of two nonprofits reaching the same potential donor. If the first nonprofit conveys a sense of urgency in the fundraising appeal and the second does not, in the mind of the donor the first nonprofit needs the money more than the second. The donor will think, “I can give to the first nonprofit now to solve the immediate problem and give to the second nonprofit later. They don’t need the immediate donation.”The problem comes when the donor forgets to give to the second organization or receives another urgent appeal from an organization and gives to them instead of that original organization that didn’t include urgency in their appeal. Using urgency isn’t a trick. It is a necessary for your organization to accomplish your great work. So in your case, using urgency in your appeal will help your women’s shelter raise the funds it needs each month. If you don’t urgently need the funds, what are you doing? You need the funds right now so you can continue completing your mission. Your audience, Rob, wants to know that your organization is an effective one to place their funds and to know that the mission that you guys are working to accomplish gets accomplished. Donors are giving because they’re passionate about your cause, not because they’re passionate about your organization. 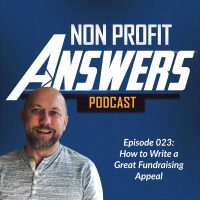 You can add urgency in your fundraising appeals, and that will help demonstrate to your donors that you’re moving forward with their cause, the thing that they’re passionate about. So I’m going to give you today six things that you can do to add urgency into your appeals. First, you got to tell your donors what they’ll miss out on. So you need to explain to the donor what they will not have experienced if they don’t give. Every donor has a reason for giving. Perhaps it’s the feeling that they get when they make the donation, or it could be an exchange for a premium. Some organizations use premiums as a pet method of raising more funds. Whatever the cause that causes the donor to want to give, you need to look at the type of donor that you’re targeting with your appeals and write your language to explain to that person what they’ll be missing out on. This may be different for different types of donors, so you really need to look at the specific appeal and what the specific appeal is for and who the audience is before you identify what that cause is. So as an example, your major donor probably has a different reason for giving than your general donor. Number two, what happens if the donor doesn’t give? Is there a consequence that you as an organization have or that your donor has that if the donor doesn’t give right now you may not have enough income to cover your expenses for the project for your nonprofit or for the campaign? So what that translate to in the appeal is you can’t help the people that you want to help. I wouldn’t write that you may not have enough income to cover the expenses of the project, but instead identify what that would then cause to the people that you’re helping. If it’s a match, then you might not be able to get the remaining match dollars if you don’t raise the necessary funds. If it’s a building fund, you may not be able to get financing if you’re going for financing for the rest of the project or even complete the building. I’ve seen some nonprofits, in the Charlotte area where I live, who have a building fund that was never completed, and they have a building that was never finished. It could be that families will go hungry because you didn’t raise enough money to meet the demand. The donor needs to understand, in a very straightforward way, what happens if they don’t give. Number three, set a deadline. So if you have a specific deadline for your fundraising appeal, tell the donor. This might be as simple as an amount you need to raise this month, or it might be the end date for a specific campaign. I never encourage you to be dishonest with your donors, but there’s often a deadline you have that you’re just not communicating with your donors. People naturally respond to deadlines. Set a deadline for when you need to raise the money by. Don’t be surprised if a lot of the giving happens in the last few days before that deadline. It’s a very natural donor behavior. Number four, in your appeal, repeat the ask. In your appeal, you may need to repeat the ask several times. Why is this? Repetition builds urgency in the reader’s mind to let them know you really need this donation. The other reason is people don’t read word for word your appeal. I know, a shocker. They skip around. They read the opening, and then they read to P.S., the first paragraph. Something grabs their eyes. They read that. They read later in the copy. By repeating your ask, you’re going to catch the people who skip around or who just skim your appeal. In the appeal, use urgent language, urgent language like now and today, and even the word urgent helps set the frame in the reader’s mind that you need to money immediately. Use words like immediate, now, today, late, tonight, deadline. Words like these trigger a sense of urgency in the readers mind. And finally, number six, use a story that demonstrates urgency. Within your story of the one, which is the story of the beneficiary and how your nonprofit has transformed his life with the help of a donor, tell the urgency of getting that help. For example, in your case, if your beneficiary is a single mom who just lost her home, explain the emotional struggle that caused not having a place to live but urgently needing shelter and food. Your reader will feel that same sense of urgency and want to help someone, like the beneficiary in your story. Your organization, Rob, does have an urgent need. You need to raise funds to accomplish the good work that you do. When you explain this to your donor, you will raise more funds and help more people. Thanks so much for your question, Rob. If you out there in the audience have a question, please go to nonprofitanswers.org and submit it. I’d love to hear from you. Have a great day.